The San Francisco Giants visited the Cincinnati Reds for a game at Riverfront Stadium on August 3, 1991. During the eighth inning and with the Reds trailing 7-3, Reds second baseman Bill Doran hit a ball down the right field line that was initially called a home run by first base umpire Dutch Rennert. Rennert then asked for help with the call and after conferring with the other umpires, home plate umpire Gary Darling changed the ruling to a foul ball. Incensed, Reds manager Lou Piniella charged from the dugout to confront Darling, threw down his hat and kicked dirt over home plate. Outfielder Paul O’Neill also threw a Gatorade bucket on the field in protest. 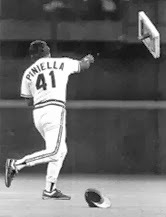 Darling tossed Piniella and O’Neill as a result of their tantrums. The Reds ended up losing 7-3. Gary Darling did not take kindly to these comments and, along with the Major League Umpires Association, filed a defamation action against Lou Piniella just four days later on August 7, 1991. The case brought by Gary Darling survived, however, and Piniella eventually settled out of court with Darling for an undisclosed amount.